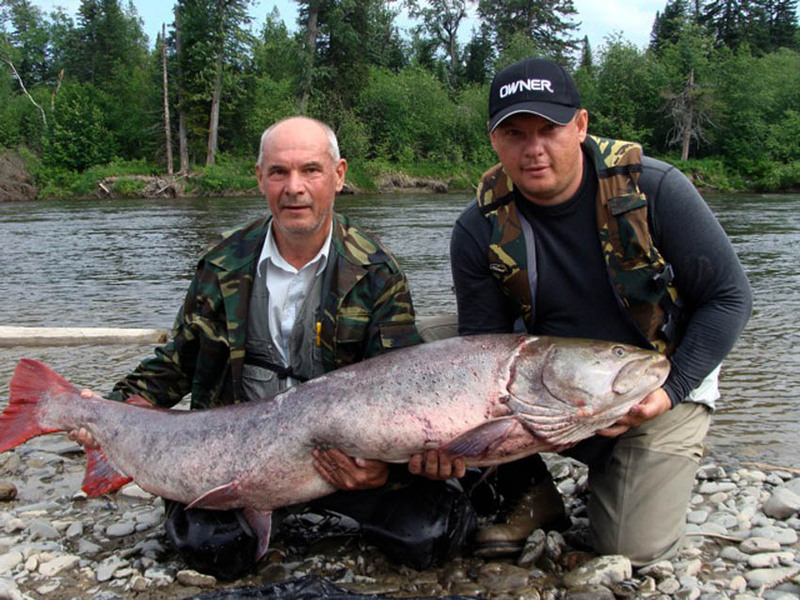 Chavanga Fish Blog: Tugur river giant taimen. We start preparing for the new season of hunting for a giant taimen. In early October on the river Tugur the next record fish was caught. I hope to tell you all the details of this event. I hope that the record of American flyfishermen will be fixed, as the official record. In the meantime, get to know some official info which concerns Tugur river and the area of the Khabarovsk Territory. The Wild Salmon Center (WSC), Khabarovsk Wildlife Foundation (KWF), and other partners have succeeded in winning the approval of the Tugursky Nature Reserve, which will protect 197,000 acres (80,000 hectares) of critical habitat within the Tugur Watershed in the Russian Far East’s Khabarovsk Region. A regional decree was signed by the Governor of Khabarovsk to establish the Reserve. Tugur River, Russia (© Mikhail Skopets, Wild Salmon Center). The Tugur River flows through the Tuguro-Chumikanskiy region of Khabarovskyi Krai (territory) and into the Sea of Okhotsk. The Tugursky Nature Reserve will safeguard key habitat for over 20 species of fish including chum and pink salmon and the threatened Siberian taimen as well as brown bears, foxes, Blakiston’s fish owl, osprey, Steller's sea and white-tailed eagles. “This achievement would not be possible without the understanding and support of the local communities, including the Evenki indigenous people, the scientific community who helped develop justifications for this protected area, and the Wild Salmon Center and their long-standing commitment to salmon conservation,” said Alexander Kulikov of the Khabarovsk Wildlife Foundation. 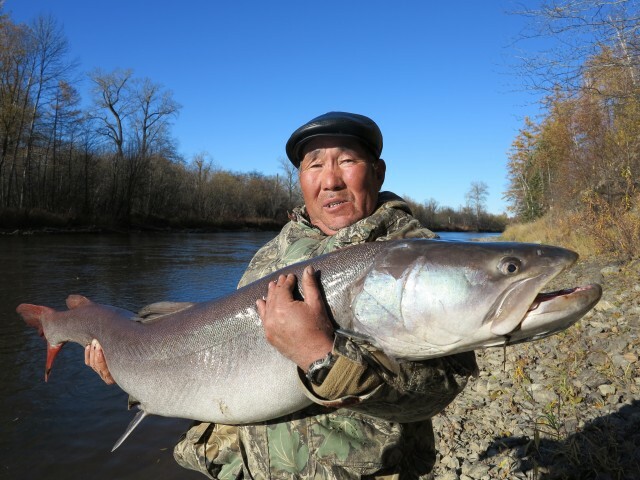 The Tugur is a global stronghold for Siberian taimen(Hucho taimen), which are a member of the trout and salmon family found in Russia and Asia. Siberian taimen are the biggest of the taimen family with the largest recorded specimen weighing 231 pounds and measuring nearly seven feet. Tugur taimen can reach lengths of over six feet and weigh up to 170 pounds and are in a special category because they are one of only a few taimen populations that feed on adult Pacific salmon. The creation of the Reserve will also help protect strong salmon runs: the river currently supports a productive commercial fishery including a 170 metric ton chum salmon catch. In 2012 Siberian taimen were assessed range-wide as Vulnerable on the International Union for the Conservation of Nature’s (IUCN) Red List. The assessors concluded that the creation of freshwater protected areas was the most urgent conservation action needed to recover the species. Over the years WSC has been serving an important role in supporting taimen conservation and assessment work, partnering closely with IUCN. Tugursky Nature Reserve, Khabarovsk, Russia (©Wild Salmon Center). See larger map. The Tugur is also a sport fishing destination. The establishment of this new protected area will provide an opportunity to demonstrate new low-impact angling techniques, including the use of single, barbless hooks. The Wild Salmon Center has been working with partners to conserve key salmon ecosystems in the Russian Far East since the 1990s. In that time WSC has helped establish four protected areas in addition to the Tugursky Nature Reserve, including the Vostochny Refuge on Sakhalin Island, theKol River Salmon Refuge on the Kamchatka Peninsula, and the Koppi River Nature Preserve andShantars Island National Park in Khabarovsk. Together they represent over two million acres of protected wild salmon ecosystems in key geographies throughout the Russian Far East. Download pdf version of Press Release. Through a partnership with the International Union for the Conservation of Nature (IUCN), the Wild Salmon Center has been building a program to focus on a unique group of Asian fishes known as taimen. The species, endemic to Asia and Europe, represent an important evolutionary legacy in the global family of salmon and trout. Recognized as the largest salmonids in the world, reaching lengths of 6 feet (3 m) and weights of over 200 pounds (100 kg), these species serve a critical function as sensitive ecological indicators in the great rivers of Asia and Europe. Based on their voracious appetite and position at the top of the river food chain (some feed on ducklings and adult Pacific salmon), they have earned the moniker of "river wolf". The expansive, pristine forests and rivers of the Khabarovsk Region are an ecological crossroads for a diverse array of wildlife. The expansive, pristine forests of the Khabarovsk region are an ecological crossroads where one can find temperate species such as Siberian tiger, Himalayan bear, and giant Blakiston's fish owl, along with northern Arctic species like moose and the Steller's sea eagle. Khabarovsk offers one of the largest remaining expanses of unfragmented temperate rainforest in the North Pacific. The rivers of the Khabarovsk region flow from the headwaters of the Amur east into the Sea of Okhotsk and host a rich assemblage of salmon, char and taimen species. Although Khabarovsk is relatively remote, salmon there are still exposed to threats from human activities. Legal and illegal timber harvest, catastrophic forest fires, and gold mining, all contribute to damaging salmon habitat. Illegal hunting and fishing are considered the strongest threats to the watershed. Creation of protected areas and efforts to reduce poaching are important strategies for preserving this rich salmon watershed. The Wild Salmon Center, in partnership with the Khabarovsk Wildlife Foundation (KWF), is working to advance the conservation of salmon ecosystems and build local conservation capacity in the Khabarovsk Region and Shantar Islands. WSC and KWF have collaborated to create four wild salmon protected areas in the Khabarovsk Region over the past several years: the Koppi River, Shantar Islands, Nimelen River, and Tugur River. In 2010 the Koppi River Nature Reserve was granted permanent legal protection status with over 94,000 acres of pristine wilderness. The regions first watershed council was established to facilitate the effective stewardship of the river and its resources. In 2013 the Shantar Islands National Park was created to protect over one million acres including the entire Shantar Island Archipelago and its surrounding marine waters. In 2013, the 197,000 acre Tugursky Nature Reserve was established to protect over 20 species of fish, including the threatened Siberian taimen. Additionally, work has begun to create a Federal Fishery Protection Zone (FFPZ) on the Nimelen River. The FFPZ is a new designation mandated by Russian fishery law offering protections for Russian salmon strongholds. WSC has worked on salmon conservation in the Russian Far East since the late 1990's. Together with Russian partners, WSC has conducted assessments of the diversity of species, habitat quality, and conservation potential of eleven priority river basins in the Khabarovsk region and surrounding areas. WSC supports grassroots initiatives of local NGOs, which share the vision for healthy salmon rivers across the North Pacific. Wild Salmon Center develops proactive models of international cooperation to achieve conservation gains significant at local, regional, and global scales. WSC supports and organizes professional exchanges, seminars, and trainings where partners share best practices in governance of protected areas, public and private salmon conservation efforts, habitat restoration, and resource management at the local, state, and federal levels. Map of the current range of all 5 species of taimen. View larger map. The Salmonid Specialist Group (SSG) was formed in 2001 under the auspices of the IUCN Species Survival Commission. Membership includes fisheries scientists and managers dedicated to protecting and restoring wild salmonids throughout their natural range. Wild Salmon Center staff are assisting the SSG in conducting IUCN range-wide assessments for salmonids across the globe. An important milestone was reached in 2012 with the completion of range-wide status assessment of all the species in the genera Hucho and Parahucho.These species were added to the IUCN Red List of Threatened Species, and the assessors concluded all species were either threatened or data deficient, underscoring the need to take immediate action to reverse declining trends observed throughout their range. The core of our taimen conservation strategy at the Wild Salmon Centers is to create freshwater protected areas. While a variety of threats exist that warrant attention, our first priority needs to be protecting critical freshwater habitat. Our on-going work has focused on two species, Sakhalin and Siberian taimen. In addition, we have established a strong, international network of specialists dedicated to work on the other species. Dr. Pete Rand, WSC’s Senior Conservation Biologist, just completed a two year study of the Sarufutsu River, a global stronghold for the species in Hokkaido, Japan. He recounts his experiences in a National Geographic Society blog post. For over 10 years we have been carrying out research and conservation work to conserve Sakhalin taimen Parahucho perryi. Initially thought to be in the same genus as the other species (Hucho), based on DNA studies it was determined that the species has diverged from the others, and thus was placed into its own taxonomic category. This is the only species in this group that spends part of its life history in the ocean. A range-wide status assessment for the species was completed in 2006 and concluded the species wasCritically Endangered. Since that time we have maintained an active research program on these fish to help guide our conservation work (see our recent publication on the species extinction risk here). Koppi River Preserve, Khabarovsk, Russia. Sarufutsu Environmental Conservation Forest, Hokkaido, Japan. These protected areas, amounting to more than 1,000 square kilometers (an area larger than the size of the Shenandoah National Park in the eastern United States), helps us secure the future of this threatened species. Sensitive riparian and floodplain habitat, increasingly under development threat, is now under permanent protection. Siberian taimen have the broadest distribution of all taimen, and are recognized as the largest member in the group. The range extends from the Ural Mountains in Europe to the Amur River in the Russian Far East, an area representing approximately 1/10 the land area of the Earth. Despite this huge range, the species was assessed as Vulnerable by IUCN in 2012 based on evidence of a long-term decline in abundance, primarily a result of overfishing and illegal fishing practices. We have been working closely with our Russian partners to establish protected areas for this species in Khabarovsk, Russia, in the lower Amur River region. The Tugursky Nature Reserve protects nearly 80,000 acres of critical habitat in the Tugur Watershed. Populations of Siberian taimen in this region are unique because they are the only populations that feed on returning adult Pacific salmon. This biological feat may make them the largest of their kind. In addition, we have also established stronger relations with research and conservation efforts focused on the species in Mongolia (maaeri.weebly.com/, www.taimenfund.org/). We look forward to combining forces to develop a more integrated, international effort to conserve these river giants.